Written by Dan Barker. Illustrated by Kati Treu. One of the greatest skills children can learn is to think for themselves. They need to know how to think clearly, how to question authority when necessary, and how to separate fantasy from fact. 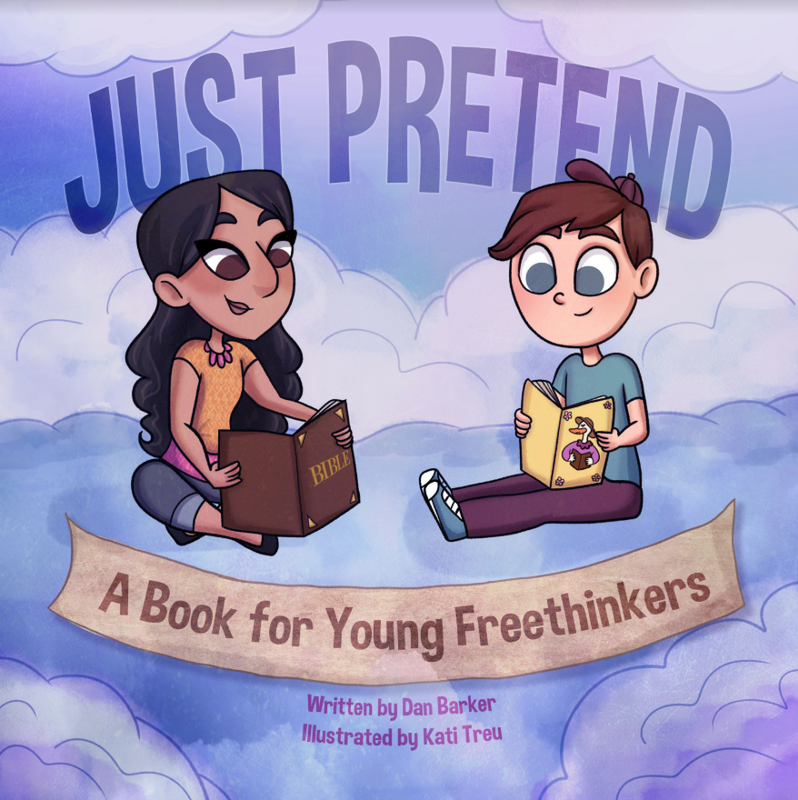 Just Pretend: A Book for Young Freethinkers is a truthful book that allows children to explore myths like Santa Claus compared with ideas like the existence of God. Just Pretend encourages children to apply the tests of reason to any idea, fairy tale, myth, or religion. Children should be allowed to make their decisions about their beliefs at their own pace. Just Pretend offers them a charming and frank look at religion from a freethought perspective. Paperback, 32 pages. Autographed by the author. "A wondrous STEM book for children which explores the formation of our solar system, our planets, and evolution on our magnificent planet Earth." Everything in our solar system is made of stardust, including YOU! This beautiful scientific fact helps us understand our connection to the cosmos and everything in the world around us. A wondrous STEM book for children which explores the formation of our solar system, our planets, and evolution on our magnificent planet Earth. Written by a father daughter duo and edited by Dr. Eric Meikle, former Education Project Director at the National Center for Science Education, to include both science fact and wonderment. A full glossary of scientific terms are included at the back of the book. My Name is Stardust is fully illustrated in watercolor and is a beautiful book that gets children excited about science and their connection to the cosmos. Maybe Yes, Maybe No is a child's introduction to healthy skepticism. The book's ten-year-old heroine, Andrea, is "always asking questions," Barker writes, because she thinks "you should be able to prove the truth of a strange story before you believe it." The book begins with a ghost story. When Andrea's friends claim that spirits are moving the kitchen dishes, she wants to check it out for herself. The adventure that follows illustrates that the best way to meet life's big and a little mysteries is with curiosity and open-mindedness. This book teaches the essentials of critical thinking - "Check it out," "Repeat the experiment," "Try to prove it wrong," "It has to make sense," - illustrating each of these rules with clear examples. Maybe Yes, Maybe No assures young readers that they are fully capable of figuring out what to believe and knowing when there just isn't enough information to decide. "You can do it your own way," Barker writes. "if you are a good skeptic you will know how to think for yourself."